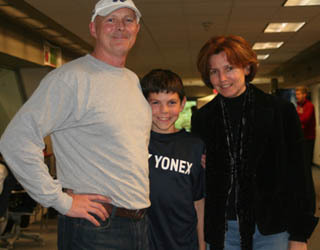 Fourteen-year-old Patrick Walker, above, posing with his parents, Randy and Anne, beat Zach Lidster 6-2, 6-4, to win the Boys 16 of this year's event October 10-13 at The Grant Connell Centre. A record number of 199 players competed in the U12, U14, U16 and U18 categories, a 30 percent increase over last year's event..
Photo 1 (left): Zach Lidster, left, and Riaan Du Toit. Zach got his revenge for their last encounter in the Provincial Championships by beating Riaan in a close 4-6, 6-4, 13-11, in the U16 semis. Photo 2: Alejandra Enderica and her mom, Guio. Alejandra's hard work at the summer camp in Argentina paid off, Alejandra beating Maria-Luiza Robu 6-0, 3-0 (Ret) in the Girls' 16 final. Photo 3: From left to right: Benjamin Sigouin, Aaron Chiu and Adrian Chiu. Benjamin beat Austin Hoole to claim the Boys' U12 title. Adrian recovered to beat Socrates Bousbouras 0-6, 6-4, 13-11 in the Boys' 14 semis, but lost to Daniel Raw in the final, 7-6, 6-2. Photo 4: Cameron Gunton, left, and Gauhar Raina. Gauhar beat Cameron 6-3, 7-5 in the Boys' 18 semis, and overcame Filip Peliwo in a close match, 6-4, 5-7, 10-7, in the final. Photo 5: Madelilne Benn, left, and Georgia Comber. Madelilne beat Georgia 5-7, 7-5, 11-9 in the Girls' 14 semis, but lost in the final to Arisha Ladhani 6-4, 6-3. Photo 6: Mark Nguyen, left, and Daniel Raw resting between their match in the Boys' 14 semis. Mark saved three match points in the second set, but came short and lost to Daniel 6-2, 5-7, 10-5. Photo 7: Every Day Champions at rest! Sponsor Dairy Farmers of Canada was actively present at the event. Girls under 18 : Sara Sassani def. Christina Malone 6-1, 6-1. Girls under 12 : Kyla Jarrar def. Luna Crawford 6-4, 6-2.